You can't say the MVC winning teams in the first three years weren't his players. 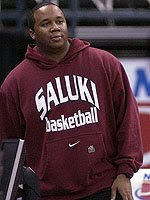 He served as Weber's top recruiting assistant. Doesn't he deserve as much credit for bringing guys like Falker, Young, etc. as he is getting the blame for flameouts like Roundtree, Bone, Wood and a flake like Tabb? Possibly the longest post I have ever read on TBDS, but totally true. There is no need to give C-Lo the boot. There are not many great candidates and he has proven he can win. Give him some time.